CHIHUAHUA, Mexico -- An out-of-control monster truck shot into a crowd of spectators at a Mexican air show, killing eight people and hurting 79, officials said. The driver was detained Sunday on suspicion of manslaughter and officials said they were investigating possible safety violations in the setup of the show. 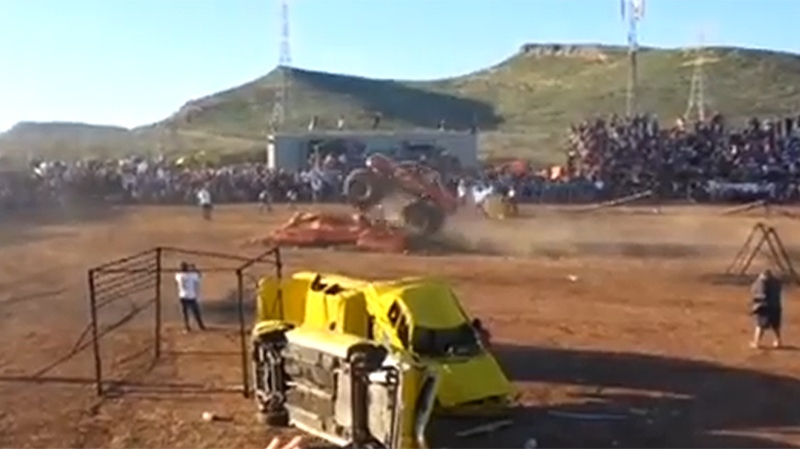 Carlos Gonzalez, spokesman for the Chihuahua state prosecutors' office, said driver Francisco Velazquez appeared to lose control of the truck after leaping over cars it was crushing during a demonstration at the "Extreme Aeroshow" on Saturday. Video taken from the stands by spectator Krizthall Martinez and provided to The Associated Press shows the truck making an initial pass over two cars. It then makes a second pass at higher speed, coming down sharply nose first and bouncing violently before piling straight into the crowd, which stood directly in the path of the monster truck unprotected by any wall or barrier. 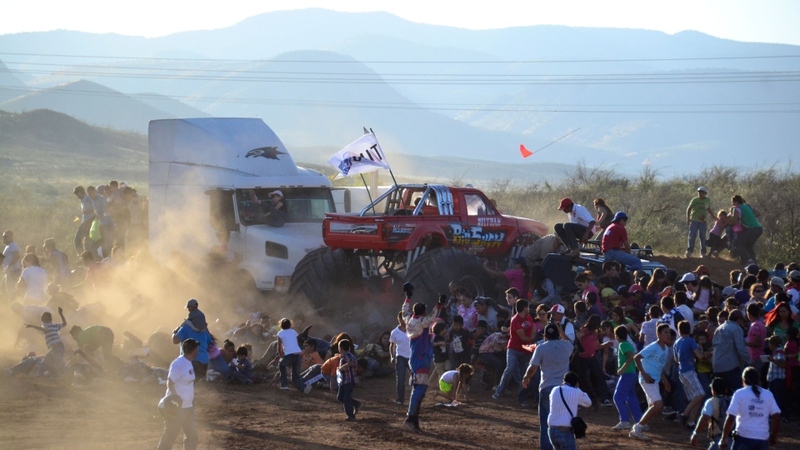 The three-day show, which included performances by airplanes, the monster truck acts and other events, was canceled after the accident on its second day in a park on the outskirts of Chihuahua, the capital of Chihuahua state. On Sunday, two armed men threw a firebomb at monster trucks and other vehicles parked at a hotel that were part of an unrelated monster truck production at the air show. Chihuahua Gov. Cesar Duarte Juarez said his administration, which was listed as a sponsor of the air show, was investigating whether Civil Protection authorities had correctly enforced safety regulations. He and other officials didn't say if those regulations required any protective barrier for spectators. Some witnesses said the driver appeared to have hit his head on the interior of the truck, which is nicknamed "Big Show," as he drove over the old cars. At least two reporting seeing the driver's helmet come off before the huge vehicle drove into the crowd of terrified spectators, who tried to flee. "I fell over, and when I turned around I saw the tire very close. It hit me and threw me to the other side," Jesus Manuel Ibarra, 41, said as he was treated for injuries to his arm and hip. Chihuahua Mayor Marco Quezada said 79 people had been hurt. Twelve remained in intensive care, with four in critical condition, he said. The governor, who declared three days of mourning, said a test had detected alcohol in the driver's breath, but he didn't reveal the level found or say whether it violated any law. Gonzalez, the prosecutors spokesman, said investigators were looking into the possibility of a mechanical failure that left Velazquez unable to release the gas pedal. Several witnesses said, however, that the driver appeared to have become incapacitated after striking his head as he bounced over small cars at high speed, crushing their roofs. Spectator Daniel Dominguez, 18, said he was happily watching the show with a group of relatives when the truck came down hard in the middle of the cars. "The driver hit his head and his helmet flew off," Dominguez said. "The truck came directly at where we were." His 11-year-old sister was in surgery for injuries to her legs, and his mother was treated for minor contusions.